The island of Hvar is considered to be the jewel, among jewels, of the Dalmatian Coast. With a splendid neo-classical harbour, it is rich in history, architecture and landscape and enjoys a climate of warm winters and dry summers. Consequently it has long been a popular destination for tourists and sailing folk alike. The best places to stay in Hvar are perfect for enjoying the magnificent sights or following in the footsteps of the illustrious Greeks, Illyrians, Venetians and Napoleonic soldiers who trod these elegantly cobbled streets in years gone by. Hvar is home to lavender fields, olive groves and vineyards. The island is 68km from end to end and up to 10km in width; it is home to just over 10,000 inhabitants. Around the coast are dotted numerous picturesque beaches and bays. Hvar Town is an ideal base for exploring the Dalmatian Coast by boat, which is simple and inexpensive to do. Visit the nearby Pakleni islands – breathe in the essence of the Mediterranean. The Illyrians believed that these, largely uninhabited, islands possessed the power to restore the soul! There is a wealth of architecture, history and culture on your doorstep – the Cathedral of St. Stephan, the Franciscan Monastery, the Hecktorovic Palace, the Fortress etc.... the list goes on. Alternatively, one can take a tour of the backstreets which are full of interesting galleries and wacky clothes shops. The town is also host to some excellent restaurants and is alive with nightlife with cocktail bars and clubs aplenty. 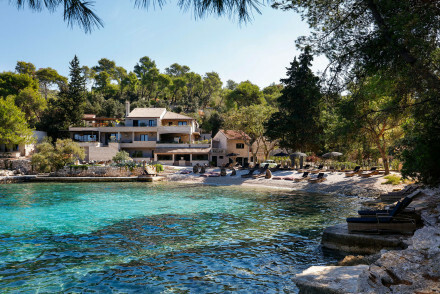 The island gets incredibly busy during the peak summer months, so if you want to ensure your room in one of the best places to stay in Hvar, you'll need to book well in advance. Alternatively plan your visit for Spring or Autumn when there are less crowds, the sun is still warm and the prices tumble! The 59 room Adriana Hvar Spa Hotel is strikingly stylish, with a glass façade and roof top bar. Situated in a prime position on the yacht harbour, it is a boutique spa hotel with echoes of South Beach Miami. The 42 room Podstine Hotel is located in a beautiful bay surrounded by palms, cypress and hundred year old pines. It has a spa with outdoor pool, Finnish sauna and facilities for treatments, massages etc. There is an excellent seafood restaurant specializing in local wines – private tastings are available on request. 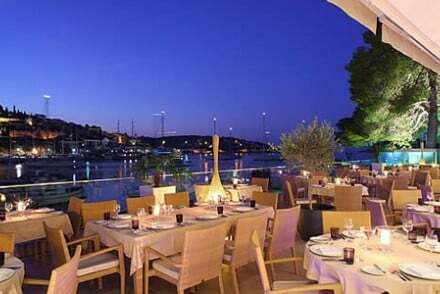 The Riva Yacht Harbour Hotel is on Hvar's promenade and boasts beautiful views of the harbour. It is a hip hotel and very popular with young couples. Full of Hollywood glamour, it is a place to see and be seen. 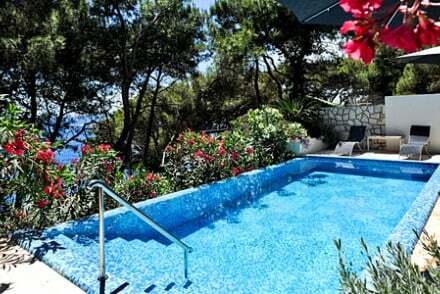 If you’d prefer a villa holiday, consider the Villa Meneghello on Hvar. It has just two apartments overlooking the ocean, with white washed walls splashed with colour. There’s a dining terrace, and you can arrange a chef by request, plus there’s a pool, bikes, table tennis and the beach is basically on your doorstep. For total seclusion, stunning views and excellent value for money book Palmizana. Just 10 mins by boat from Hvar, here you'll find an arty retreat with two restaurants serving fabulous Mediterranean cuisine. If you want to hire a car - which we highly recommend if you’re staying in Hvar and you want to see more of the Dalmatian Coast, but don’t have a sail boat - we recommend you visit our online partner Rentalcars. Or the best hotels on the Dalmatian Islands? A buzzing hotel on Hvar's promenade. Contemporary chic rooms and suites have all the mod cons, white furnishings, and splashes of modern photography. Excellent seafood restaurant, cooking lessons, and a lively bar in the evenings. A hot spot for young couples. City Style - A thriving spot with excellent food and lively after-dark DJs. Lively - A lively spot next to Carpe Diem. Outstanding location - Located on Hvar's pier. A fabulous spa hotel in a prime spot in Hvar overlooking the bay. Contemporary chic rooms and suites with all the mod cons and balconies. Top of the range spa, excellent Mediterranean cuisine and roof terrace restaurant, and close to all the attractions. Gourmet, pampering, romantic. Wellbeing - The hotel is designed for total pampering. Outstanding location - Fantastically located on the bay front. 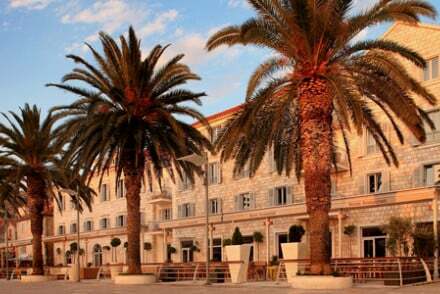 A charming hotel two bays away from Hvar Old Town. Located on the water's edge, a perfect sunbathing and diving spot. Beachy rooms and suites in vibrant colours with private balconies. Fabulous seafood restaurant, pool, and spa treatments. A super choice for a beach holiday. Views - On the sea face the hotel has unrivalled oceanic views. Spa - Featuring gym, Finnish sauna, hot tub and wide range of treatments and massages. Sights nearby - Boat visits to Vis or Brac islands. A dreamy villa, or two apartments, overlooking the sea front. Charming boutique rooms have white washed walls and splashes of colour. Kitchen and dining terrace, chef on request, pool, bikes, cinema, and beaches on its doorstep. Ideal for a family or groups of friends. 7 nights only peak season. Families - The ideal spot for families: shallow beaches, table tennis, bikes, cinema, chef on request. Local markets - Croatian designers stocked in boutiques in Hvar town. A charming boutique hotel nestled in a quiet and secluded bay. Simply styled rooms are light and bright with whitewashed walls, contemporary art and lovely sea views. The terrace restaurant serves fine-dining French cuisine. A tranquil spot from which to explore the Dalmatian coast. Hideaway - Set in a picturesque and secluded bay this is the ideal spot to get away from it all. Sights nearby - Visit the majestic St. Stephen’s Cathedral in Hvar Town. Sailing - Take a ride on the hotel's private speedboat.